Kristina does the Internets: What Books Are You Reading? The first trip I took with Jeff's family was to the beach in Florida with them for the week, and I neglected to pick out some paperbacks ahead of time and ended up grabbing The Yonahlossee Riding Camp for Girls at the airport bookstore. It was super trashy but enjoyable, and I told Jeff's mom I loved it and she had to read it. Before I got more than ten pages in and discovered a major theme was kissing cousins. Oops. She asked to borrow it when I was done and I had to pretend I had lost it. To avoid embarrassing myself, this year I made sure to stock up on some paperbacks ahead of time. I'm super excited to read The Female Persuasion (the latest by Meg Wolitzer - did anyone else love The Interestings?? ), Educated, and Atonement, and pretending I'm not excited but definitely am psyched for a little YA action with The Thousandth Floor. 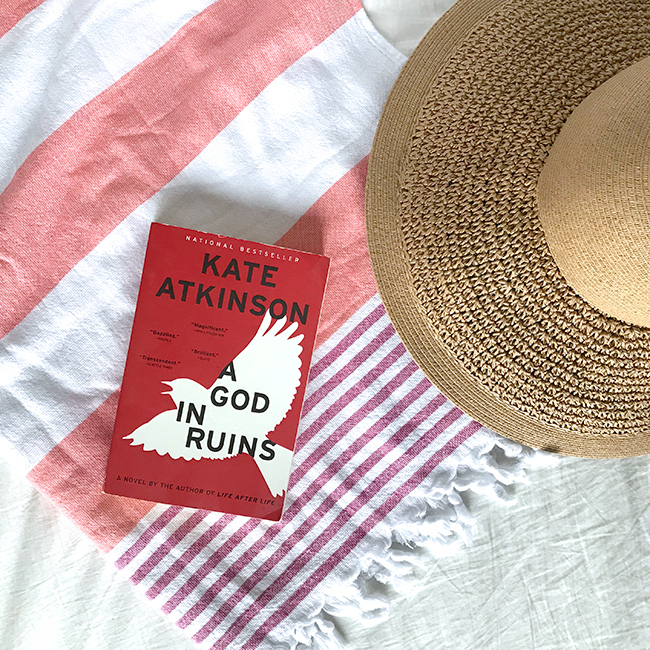 I loved Life After Life, and A God In Ruins is the companion novel - they run at the same time from different points of view. Rules of Civility - If you loved A Gentleman in Moscow, this is another novel by the same author. I actually didn't realize it when I started reading the book and was somehow able to guess they were written by the same person. The story follows a woman in New York in the years leading up to World War II and how her life changes after a chance encounter with a handsome millionaire. It sounds like a beach read, but it really is a lot more substantial than that. Little Fires Everywhere - This story opens with the Richardson's family home on fire, and then dives back through the seemingly perfect lives of their four teenage children over the previous year to see how the arrival of a new girl in town causes their family to fall apart. This was a fast read but so much more than your typical beach book. Manhattan Beach - By the same author as A Visit from the Goon Squad, this book weaves together a coming of age story about a young woman in New York City during World War II, a mystery about the disappearance of her father after he starts working for the wrong people, and the life of a glamourous nightclub owner with ties to the mob. I really felt submerged into the world of NYC in the '40s, and the driving force of the storytelling combined with the beauty of the writing made this novel hard to put down. The Identicals - Now here's a true beach read! This story follows the life of identical twin sisters living so close but so far from each other: one on Martha's Vineyard, the other on Nantucket. Just like the islands, they look alike at first glance but are completely different below the surface. Until, that is, circumstances cause them to change places for the summer. This is definitely a great easy read for the summer! Do you have any favorite books you've read lately?